Pamela, Ruth (2010) Persepsi Anak Tentang Film Kekerasan Di Televise Dan Bimbingan Media Orangtua. Skripsi thesis, Universitas Tarumanagara. Purpose of this studi are to knowing children's perception on violence program on television and knowing parental media guidance. 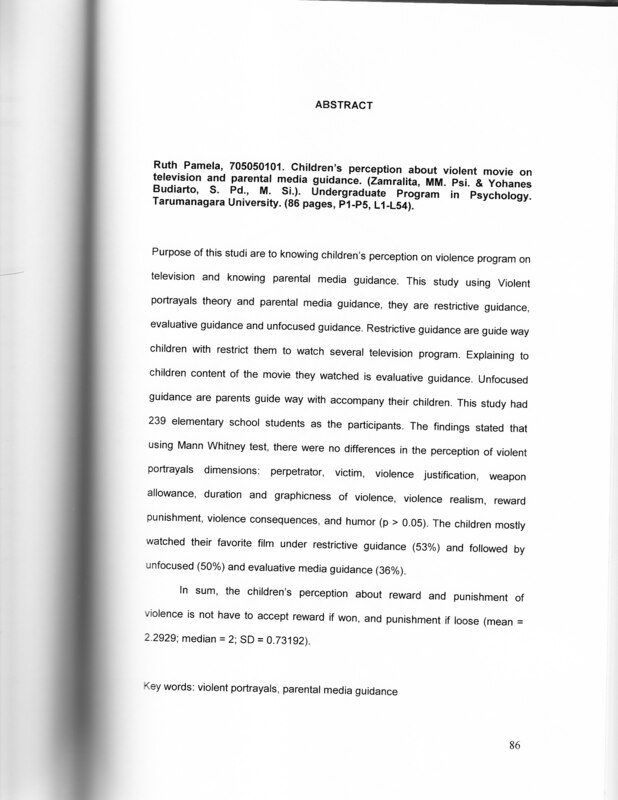 This study using Violent portrayals theory and parental media guidance, they are restrictive guidance, evaluative guidance and unfocused guidance. Restrictive guidance are guide way children with restrict them to watch several television program. Explaining to children content of the movie they watched is evaluative guidance. Unfocused guidance are parents guide way with accompany their children. This study had 239 elementary school students as the participants. The findings stated that using Mann Whitney test, there were no differences in the perception of violent portrayals dimensions: perpetrator, victim, violence justification, weapon allowance, duration and graphicness of violence, violence realism, reward punishment, violence consequences, and humor (p > 0.05). The children mostly watched their favorite film under restrictive guidance (53%) and followed by unfocused (50%) and evaluative media guidance (36%). In sum, the children's perception about reward and punishment of violence is not have to accept reward if won, and punishment if loose (mean = 2.2929; median = 2; SD = 0.73192).